The primary election set for Aug. 7 will have a race between Republicans for the District 2 Osage County commissioner position. Three Carbondale area Republican candidates have filed for the position currently held by Osage County Commissioner Mike Pruitt: James R. Foster, Mark A. Van Camp and Gaylord D. Anderson all filed their intent to run for the office before the June 1 deadline. There will also be contested races in for county attorney and sheriff. Filing for the county attorney position were Osage County Attorney Brandon L. Jones, an Ottawa Republican, and Anderson County Attorney Frederick B. Campbell, a Libertarian from Garnett. Filing in the sheriff’s race are incumbent Osage County Sheriff Laurie Dunn, Republican, of Lyndon, and David Kidwell, Democrat, from Scranton. District 3 Osage County Commissioner – Kenneth J. Kuykendall, Osage City, Republican. Osage County Clerk – Rhonda Beets, Lebo, Republican. Osage County Treasurer – Jo Ann Hamilton, Vassar, Republican. Register of Deeds – Linda L. Massey, Lyndon, Republican. 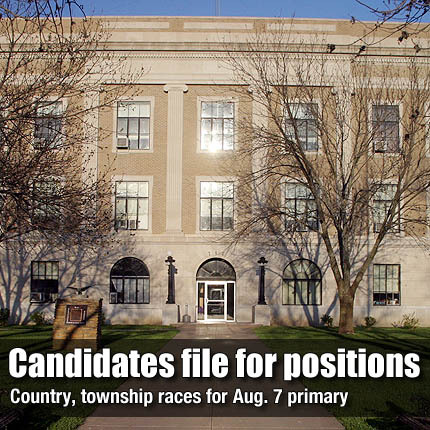 Agency Township Trustee – Matt R. Sowers, Melvern, Republican. Agency Township Treasurer – Larry Yockey, Melvern, Republican. Arvonia Township Treasurer – Don Rogers, Lebo, Republican. Barclay Township Treasurer – Dennis D. Brock, Reading, Republican. Barclay Township Trustee – Frank J. Loschke, Osage City, Republican; Russell H. Balding, Reading, Republican. Dragoon Township Treasurer – Jarrod Lindbloom, Osage City, Republican. Dragoon Township Trustee – David W. Thompson, Burlingame, Republican. Elk Township Treasurer – Janice M. Ballenger, Overbrook, Democrat. Elk Township Trustee – Tom Moore, Overbrook, Republican. Fairfax Township Treasurer – Jan Koehler, Lyndon, Republican. Fairfax Township Trustee – Robert Scheid, Scranton, Republican. Grant Township Treasurer – Patrick S. Bean, Osage City, Republican. Grant Township Trustee	– Fred L. Pearson, Osage City, Republican. Junction Township Treasurer – Jane M. Smith, Vassar, Republican. Junction Township Trustee – Donald L. Croy, Vassar, Democrat; Gary Summers, Vassar, Republican. Melvern Township Trustee – Jeff Swendson, Melvern, Republican. Osage City Ward 1 Committee – Linda K. Getsinger, Osage City, Republican. Osage City Ward 3 Committee – Carolyn J. Rosetta, Osage City, Democrat. Elk Precinct Committee – Larry D. Woodson, Overbrook, Republican; Dee Ann Woodson, Overbrook, Republican. Junction Precinct Committee – Gary Davis, Vassar, Republican; Kathleen E. Davis, Republican. Melvern Precinct Committee – Kathryn L. Dewey, Republican. South Ridgeway Precinct Committee– Gaylord D. Anderson, Carbondale, Republican; J. Sue Anderson, Carbondale, Republican. Scranton Precinct Committee – Dana K. Webber, Scranton, Republican. Superior Precinct Committee – Casey Mussatto, Osage City, Republican. North Valley Brook Precinct Committee – Ronald R. Groff, Lyndon, Republican; Lois Wadsworth Butel, Lyndon, Republican. South Valley Brook Precinct Committee – Virginia Kersten, Lyndon, Republican.